Passionate prose is my PARAMOUR. There’s a moment just before you drift off to sleep (or are just waking up) and I call this Twilight Time because your mind is in two stages. It also happens to be when the ideas tend to come to me; sometimes I’m good about remembering them when I wake up, other times not so much. That’s why I’m here to preach the importance of having a notebook and pen sitting next to your bed (or wherever you happen to sleep). Last night, as I was drifting to sleep, a fragment of an idea the size of a diamond fleck came to me. The Sandman had given me an extra dose, so I was fighting it as I clawed my way onto my side and grabbed the notebook off the nightstand, luckily the pen rolled onto the bed with it. I scribbled that first small thought. Then another followed. Before long, I had the page completely filled with gems that I would need to gently thread into a story. But, I also had something I was not expecting. Some time ago, I’d say about six months, I had developed a general premise for a story. No matter which way I spun it, however, it never quite felt right to me. I already had the title, which I loved, so I just let it sit. When I had finished scribbling my notes, I realized that one of the lines was the title to that story that never quite wanted to be written. Until now. Stories are strange creatures. Some will let you know the moment they are conceived, but will force you into a gestation period–like the one above. Others won’t let you know they’ve been conceived until you’re delivering it right on the page. While I go through each chapter individually, I’m allowing myself to relive the story as though it’s the first time I’m hearing of it. The results of that mindset have been somewhat amazing. It’s allowed me to look at the scene from new eyes and find things that I might otherwise have overlooked. Following the second draft of the first chapter, I sent it out for a quick critique and one of the responses I received mentioned that my male lead had revealed more of himself this time around, which is a splendid thing. I’m trying to do the same thing for the second chapter, but I’m finding it a bit difficult to slip out of my male lead’s head and into the female lead’s. They have two distinct voices and I need for that to come through in the writing and style. Rather than spend time revising chapter 2 today, I do believe I will spend that time interviewing my female lead. Plus, I’m certain it would help if I could come up with that elusive scene song that captures the mood and mindset of the character. Yeah, I know that I said I was sticking my novel in a drawer until I was ready to edit it, but I just can’t get it out of my mind; it’s not ready to sleep just yet. So, I find myself doing something interesting: editing chapter by chapter. Before, I would run off the entire novel (at least, what I had), then read it through and just mark it as I went. Now, I’m only printing off one chapter at a time, beginning from the first. The goal is to tighten up the scenes, edit the language and errors, and overall, polish it, then move on to the next. In grade school, we were told that to be a good raconteur, we should remember the 5 W’s (and sometimes H). I was stuck in traffic when the song came on. 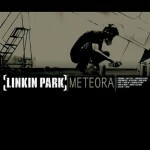 It was by Linkin Park and I suddenly felt inspired to write a particular scene I’d been putting off because of its delicacy. In that brief moment when I was able to let my mind drift and just listen to the song, the harsh beat (which is my male lead), the melody (who he is inside) and the words (his desires), I suddenly realized it was the song for his revelation. Sometimes a regular notebook just won’t cut it. A couple of months ago, I hit a brick wall when it came writing. I’d sit at the computer with my fingers hovering above the keys and nothing would come out. Then I’d move to using the good old fashioned paper and ink method, only to be met with the same results. Liquid Story Binder XE (LSBXE) is a fine piece of software for writers. It allows you to organize your thoughts and notes, helps you create your story whether an instructional manual or novel, and then compile it all when you’re done. This has been cross posted from Today, I Read… since it was written before Today, I Wrote… actually launched. Avid readers tend to be writers, or aspiring authors, whichever you prefer, so in the spirit of the No Plot? No Problem! review and NaNoWriMo itself, I’ve decided to publish a brief outline of how you can use Liquid Story Binder XE (LSBXE) to breeze through your November novel. LSBXE is a full featured program created specifically for writers–all writers, but especially fiction writers. It’s perfect for NaNoWriMo because it allows you to create goals (time and word count related), take notes, add pictures, playlists, and dossiers to keep you focused and inspired, all within the program. To make an already great program even better, it also has a Work Log. This log keeps track of your writing progress on a per book basis. 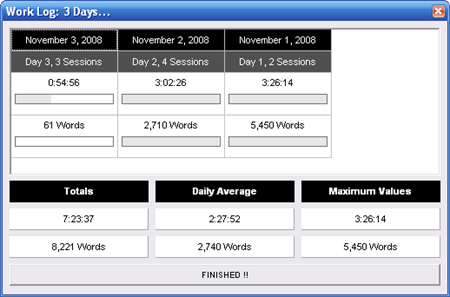 It tells you how long you’ve had the program active and how many words you’ve written for that day. It also tells you your total word count, calculates your daily average, and offers up the longest time you’ve spent writing and the most words written in a day. Dear Author, Grow an Organic Story Please. All content published on TodayIWrote.com falls under U.S. copyright law and international copyright treaties. The content may not be reproduced, in whole or in part, in any capacity unless written permission has been granted by the copyright holder. Thanks for not stealing. Design lovingly handcrafted by Teli Design Studio.